What could be better than kayaking in the pristine waters of the Antarctic, the earths most exquisite setting of snow thickened mountains and peaks that formed the Andes tail ,with ice bergs as disturbingly shaped as Richard Sierra sculptures, glaciers patterned like wadded paper, calfing (breaking off) as they move slowly forward and my kayak partner and I getting up close to nature in a yellow rubber floater with only a blue paddle to keep us from harm? (We wore alarms around our necks in case we got stuck somewhere. We were warned not to push the button for hot chocolate.) It's been the best thing I've done since paragliding. Photo: My first time in the saddle, all kayak, no paddle. As we glided on a reflective sea, the heavy silence of Antarctica was pierced only now and then by complaints of penguins fussing to find a place to jump into the sea (they are really picky), the cracks and bangs of ice falling as the day warmed to 40 degrees, and my laugh of complete awe and delight that God had allowed me this moment in my life - on a Sunday to boot. Photo: "What's she doing? We better get outta here." 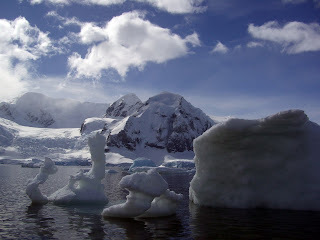 Penguins, battalions of them, plied their trade of amusing us as they lined up along edges of short snowy cliffs banding the shore of this tremendous and calm Herrera Channel [Link: map] trying to find a place to jump in or jump out, about three feet high. They thrust out their flippers for wings but jumped hard, not at all like the graceful torpedoes they become when swimming underwater around our kayak. A singular Weddell seal with long eye lashes lolled in the sun, at times lifting its fin over its eyes as if it was all too much for him, too. And a pair of white Snowy Sheathbills mated on the edge of the beach until a penguin policeman waddled over and pecked one on the back to break up the affair. He really did. Watching penguins at mating season surely beats America’s soaps. Photo: Various kinds of bergs. This channel must be as close to paradise as anyone could get. Picture post card perfect, coffee table book perfect, a photographers heaven, a naturalists meringue, an adventurers impossible dream. I had never set foot in a kayak and didn’t know if I’d end up at the bottom of the icy bay or not but I liked the idea of doing something on my own again, not in a group of people in red jackets and caps. Each kayak pair received a good briefing on safety and dangers, travel boundaries and a reminder survival in these freezing waters is about five minutes. 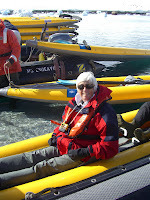 But our kayaks are made especially for the Endeavor’s trips here and in the Arctic. They are built so that no one can make them roll over. The two-seaters are comfortable and uncomplicated. The steerer presses petals in the back to go left or right, whereas the front runner spies scouts potential wrecks. Photo: "Who's going up? I'm going down!" Penguins following the flow. If we ran aground, (often as we floated closer to the shore to photograph the penguins) one of us stepped out of the kayak in our super duper waterproof Antarctica boots on to the small rocky shore and pushed away. The water was so clear I felt I could see to China, and at least the penguins porpoising for fish, swam by our kayak to see what was up. 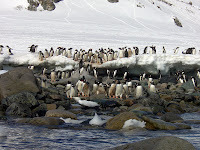 If there is a given in Antarctica, it’s penguins. They are everywhere - in colonies, tobogganing down the snow-covered mountains leaving trails like snow boarders, then climbing back up again to build rock nest, getting started on egg sitting that must come at this time to be successful. A gaggle of penguins had chosen to sunbathe, I guess, and were near the shore, deep in the snow, just lying fat on their stomachs. I thought they might be sitting on their nests, but they were merely loitering and taking advantage of the spring sun. It was a funny sight. After two and a half hours on the water taking photographs and floating peacefully up to indescribable artistic ice bergs (anything higher than our paddles length we were to stay away from because bergs are constantly falling apart as spring warms the continent), it was time to come back to the ship. I was paddling with a serious photographer. She was in charge of the direction of our turns, I was in charge of maneuvering the kayak and pushing us off the rocks and icebergs. A special docking station had been set up in the middle of the kayaking area. It was like a swimmer’s floating dock. On two sides Zodiacs were attached to a metal deck. When you reached it from the ship in another Zodiac, you slid from one Zodiac to the other and then to the stabilized dock as you slipped down into the kayak - and thereby escaped getting too wet. An amazing system. Most of those kayaking were couples willing to cooperate with each other and fall in love again as they might on a Sunday outing at Pickwick Dam. Photo: After two and a half hours, now a cool and accomplished kayaker. The day was not without its drama. On arrival in the channel, our captain had been able to put the Endeavor bow onto the rocky shore in order to secure it and cast anchor. (It’s called "riding the anchor.") As the morning waned, alas, so the tide went out and was an hour late returning to a floatable level. Well, when it was time to leave, the Endeavor was unable to push back and we all had dreams of spending a day here waiting for the tide to roll in. Some of the passengers went in Zodiacs for a short tours of the channel. Others of us were so exhausted from the morning outing we slept. Finally sufficient water ebbed back (as did a snow storm) so the ship floated backwards and motors started once again. We breathed a sigh of relief, ate a huge home-made sticky bun offered for tea, and resumed our anticipation of visiting the British based Port Lockroy Base A. 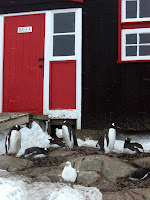 Photo: Some of the residents of Fort Lockroy, Base A. There, after dining with the three brave people who live in the quaint Fort Lockroy Base quarters all summer (surrounded by penguins and the odor that comes with them) doing research, we followed them to Zodiac landings in a snowstorm and visited the tiny souvenir shop, museum and post office, where sales keep this experimental station alive. It is the only shop in all of Antarctica, which is bigger than the United States and Mexico combined. Can you imagine? But they had no chocolate bars. We are happy you are safe and sound and having so much fun! The ship rescue made the Commercial Appeal this morning. The kayaking and penquins, etc... sounds like an amazing experience. Wish we were with you.